One of the nicest private rooms of the hostels we've stayed! 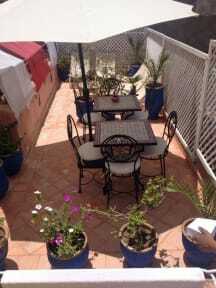 Very hospitable host, clean room and bathroom, beautiful inside, good location, tasty breakfast! The host had a rude attitude sometimes (not always). But the worst thing is they recommended I use their taxi service and lied about the reasonable fare for a trip (more than 3x real cost). Since hostel guests rely on their hosts for reliable information about the place they're visiting, I wouldn't recommend this Riad.